Harris Baseman, thorium and other thought-provoking issues. 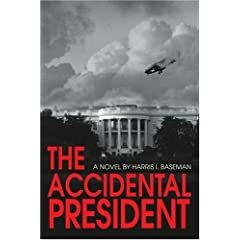 When an explosion rips through the home of Gulf War veteran Clarence Davenport, Secret Service Agent John Wallace and White House aide Molly Pemberton are certain that Davenport, the assassin who killed President Butler, had killed himself. President Silver, the former Education Secretary who became the first Jewish President of the United States when Davenport killed all other legal successors to the Presidency, informs the nation that the crime of the century has been solved and that the perpetrator is dead, only to have to admit, days later, that Davenport had escaped. National outrage at Davenport's escape escalates, fueled by Senator Jeb Davies' political ambition and his hatred of Ben Silver. Davenport, the world's most sought after fugitive, with no other place to go, is recruited by Saudi expatriates opposed to the Royal Family and ends up in an Al Qaeda training camp where he devises another plan to kill President Silver and attack the United States. Silver tries to stave off the rising tide of impeachment and at the same time combat the increasing risk of a terrorist attack that will destroy the Presidency and fundamentally change the Unites States unless he can avoid impeachment and intercept the threat.